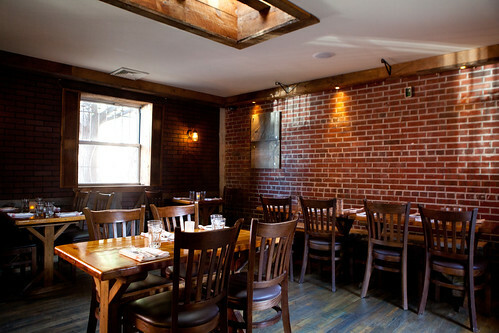 Chió (pronounced kee-OH) is located on the Waterfront District of Brooklyn that mainly focuses on rustic Italian fare, opened in August 2012. Unlike most restaurants, co-owner Chef Alex McWilliams created a menu that has hints of proteins (meats and fish) rather than focusing on it. Their wine menu (no hard liquors and spirits served) is focused on biodynamic, sustainable and organic offerings that place a strong emphasis on the growing and harvesting process. These handcrafted products are sourced from boutique producers who are passionate about their craft and committed to small production. They are reasonably priced and all of what’s listed are meant to pair well with the food. 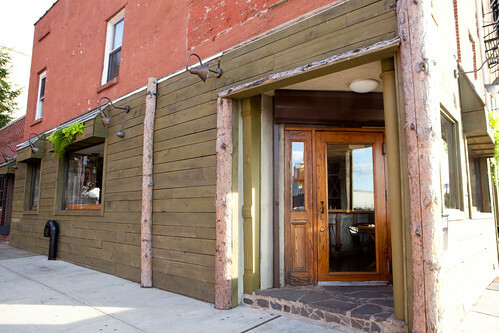 The restaurant itself is made of reclaimed wood paneling and wood topped tables set the tone for a warm, relaxed ambiance. In the front room a large L-shaped bar with tables lining the opposite wall. The main dining room is has a large communal table with benches fashioned from a split log set against an exposed brick wall. 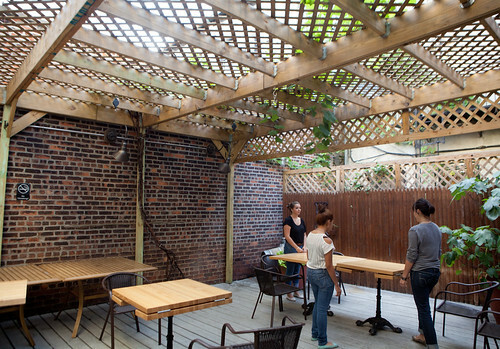 There’s a lovely, spacious garden/patio area adjacent to the main dining room. 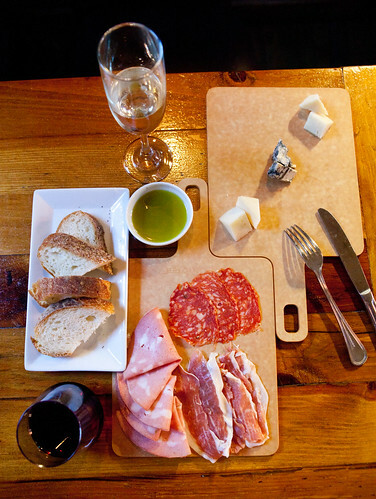 We started with platters of salumi (La Quercia American Prosciutto, Pistachio Mortadella and Sopressata; 3 items $12) and a trio of cheeses (Bra tenero, Pecorino di fossa, and Gorgonzola Piccante; 3 items $9). All were very good, especially the silky prosciutto and the semi-firm, dense, slightly piquant bra tenero cheese. 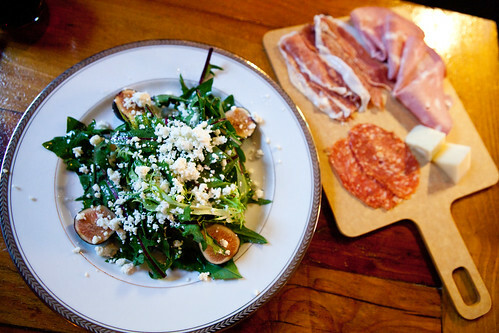 The Mission fig salad ($12) with rosewater vinaigrette and crumbled goat cheese was respectable. The dressing really saved this salad from being typical to other fig salads. We washed these down with our glasses of 2009 Raventos Cava ($12 per glass) that was crisp, effervescent with nuances of white peaches, and a smooth 2010 Heron Mendocino Pinot Noir ($8 per glass) with flavors of black cherries and plums that could go with almost any food item. 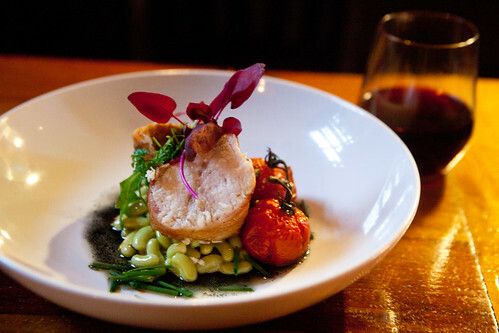 From their stuzzichini (appetizers) section of their menu, we opted for the speck wrapped swordfish, fresh shelled beans, roasted vine tomatoes, squid ink vinaigrette ($14). It looks gorgeous and it was cooked perfectly but it lacked the punchy flavors I’m hoping for. It needed something spicy, acidic, or briny to make this dish amazing. 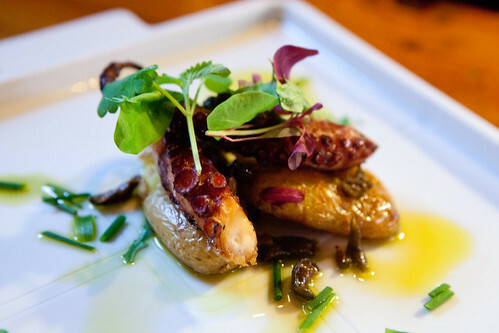 On the other hand, the charred octopus ($12) with fingerling potatoes, dried ceriginoise olives was excellent. Tender, not too chewy octopus tentacles that had enough bitter char to pair with the briny, semi-dried olives, and their fruity, black pepper-like spicy olive oil drizzled on top. We would have ordered multiple dishes if we didn’t have to eat other dishes. 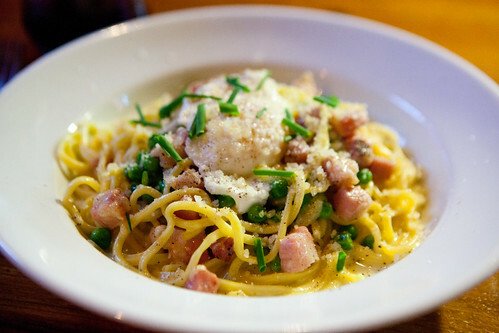 Moving on to their main entrées, which is essentially their pastas, we had their saffron scented chittara, peas, pancetta, cracked black pepper, soft poached farm egg ($18). The handmade pasta was perfectly cooked to al dente with enough springy chew. The dish’s accouterments were good and the creamy egg yolk did created a very rich sauce. It’s a solid pasta dish for times when you crave something on the heartier side. 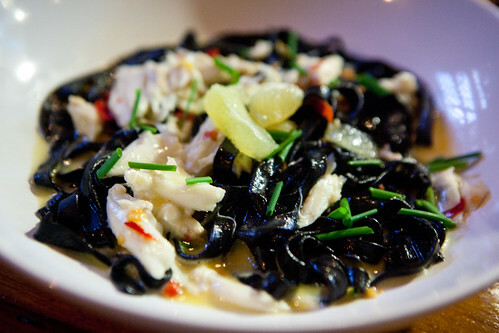 Their squid ink tagliatelle with jumbo lump crab, garlic, Calabrian chili, parsley and cured lemon ($20) was a clear favorite of the two pasta dishes. The robust, harmonious flavors of spicy, slightly tart and sweet made this bowl of pasta utterly delicious. 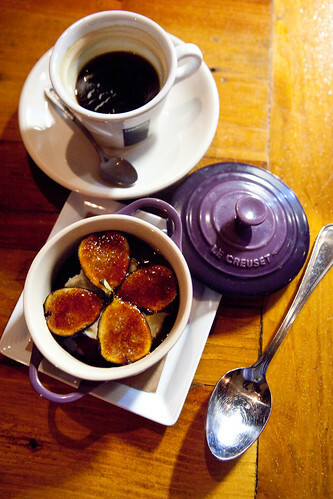 For desserts ($9 each), the seasonal offering of brûléed figs with mascarpone cheese and fig glaze was minimalist but simply delectable that my companion would order seconds if we didn’t had so much food beforehand. Complex fig flavors bursting at every bite and the creamy mascarpone cheese was a great vehicle for the flavors. The lavender scented goat cheesecake with a graham cracker crust was good and delicately floral. 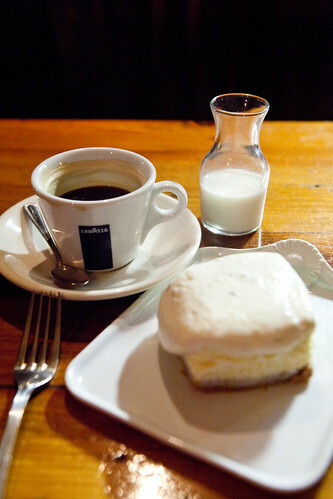 I had desserts with my Americano, which was decently made. 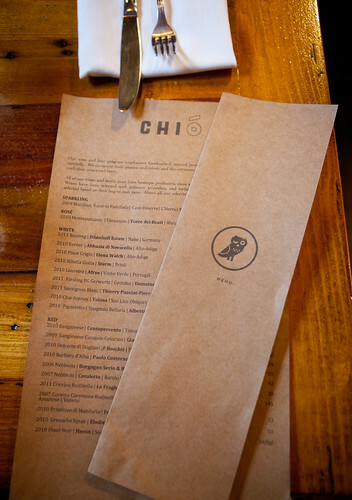 Overall, Chió’s Italian food was simple but it has small interesting tweaks to make it worthwhile. It’s the kind of neighborhood restaurant I would go to if I was around there, as the prices and portions are reasonable.